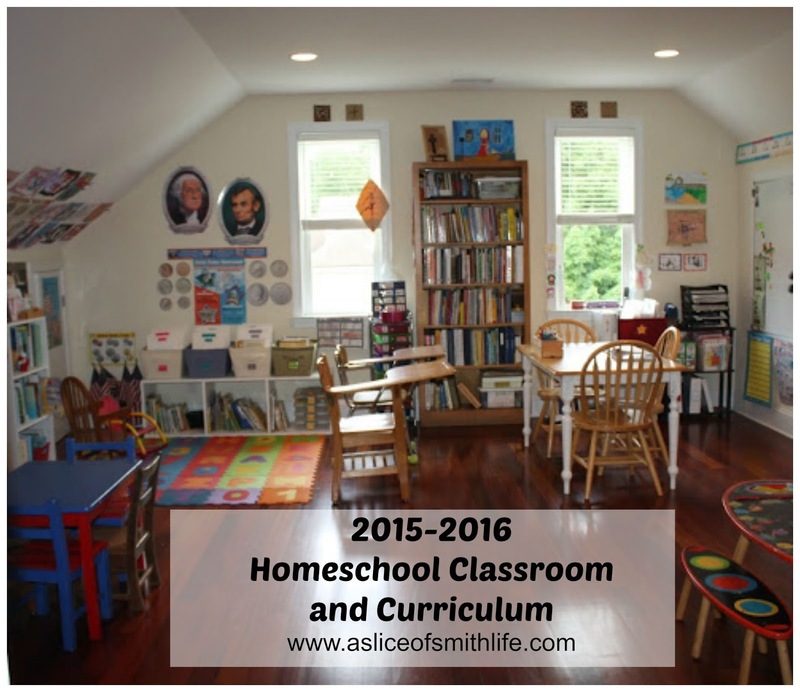 We will start our 2015-2016 homeschool year on Monday, August 10! I usually start early August for a few reasons. I like to get back in the swing of things before my birthday on Aug. 24th (this year I turn the big 4-0, though last month felt like my birthday with my husband's big surprise! :) ) and it's nice to get back into a school routine before the extra-curricular activities start. This year we will do school work for two weeks and then the week of Aug. 22-29 our family will take a vacation to the beach with my parents, siblings and their families like we did last year in September 2014, but at a different beach this year. Then after our beach vacation we will continue with our homeschool year. When we built our home in 2006, we were already homeschooling our children. I am grateful that the floor plan we chose allowed our family to use the "game room" as our homeschool room. Above is our homeschool classroom from the door's entrance. Not much has changed since last year with how our room looks and how I organize our homeschool books. 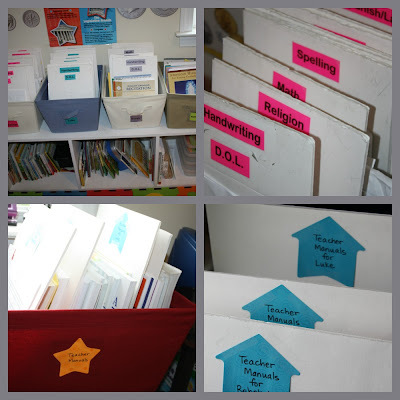 If interested, take a little tour of the room and an explanation of our book baskets and foam boards where our curriculum is stored and stays organized . I must say I struggle finding the "perfect" system for many things, but our book baskets have worked for us for several years now so that's one thing I'm not changing (yet). Maybe it will inspire you and be helpful! Before I list what our curriculum choices are for 2015-2016, here is a list of my curriculum posts from 2010 on. I put the grades each of my children (aka "Cupcakes" :) ) were in for each year in case anyone is interested in a particular grade level. I will say that I pick and choose my curriculum for each subject and I don't use a box curriculum. When I first started homeschooling in 2005 I did use Catholic Heritage Curricula (CHC) lesson plans for my oldest who was in kindergarten at the time. I was new to the homeschool journey, had 3 young children and felt I just couldn't "make things up", but I found I ended up picking and choosing some curriculum that was not suggested by CHC through the year. I have kept with the picking and choosing method ever since. For me, having the freedom to choose curriculum for each subject each year has been a blessing and a curse. I enjoy the flexibility of using so many different and wonderful resources to fit my children's learning styles and needs, but it can be overwhelming to choose curriculum because there is sooooo much out there. 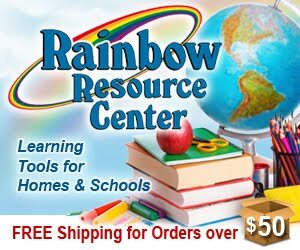 The one company that has helped me not only choose great curriculum for each subject, but has also saved me tons of money through the years is Rainbow Resource Center. Their catalog is so user-friendly, as well as their website. Their huge catalog is divided into various subjects and I love that there is a summary of each product so I can get an idea of what a product is before I purchase it. Besides curriculum, they also sell school supplies, games/puzzles/toys, and offer homeschool helps. Their prices are lower than retail and I love that there is free shipping for orders over $50! With their wide selection, I never have trouble spending at least $50! Rainbow Resource Center is really a one stop shop for not only homeschool families, but any family looking for educational materials to suit various needs. Be sure to check out Rainbow Resource! My family, along with 7 other families and 20 children ranging in K-8th grade will meet at a local Catholic Church one day at week and use the Alpha Year cycle and the subjects covered are: Religion, Latin, History, Science, Math, Timeline, Geography, and Great Words I and II. We will also incorporate the CCM science experiments, Charlotte Mason Picture Study Portfolios (Giotto and Fra Angelico) , SQUILT music Volume I: Baroque Era, and IEW Ancient History writing/grammar during the co-op gathering time. So as I was choosing my own family's curriculum for this year, I was keeping in mind the CCM program and subjects that will supplement our work at home. * She will be receiving her Confirmation this year in September. Yay! * various Literature selections that I chose that fits with the time periods in the Christ the King Lord of History text. The Literature selections that I have chosen so far, but will be adding to the list are The Children's Homer , Saint Dominic , Saint Thomas , Saint Ignatius and the Company of Jesus, and a WWI and WWII novel that will be decided upon later in the year. Note: I have spent many, many hours planning out my daughter's World History/Literature course and writing lesson plans for the entire year. If you are interested in finding out more about the lesson plans, please contact me. (Last year my daughter took 1st Form Latin with Memoria Press Online Academy, but this year, I decided to have her use the 2nd Form Latin DVDs and texts and try to learn this level at home vs. online.) I plan to write a review comparing the 2nd Form Latin DVDs that I received from Rainbow Resource and the online Latin class my daughter took last year. * I will choose various Ancient literature books and study guides to go along our CCM Alpha cycle. The first book is Mara, Daughter of the Nile and while she's reading the book she will use Study Guides for Children's Books that I found while searching the internet. I plan to use study guides for other titles that I plan on her reading. I'm still working on her book list, however. So this is our curriculum that I have thought and prayed long and hard over and I'm sure things will have to be reassessed and changed as the year moves along. Be sure to come back to my blog here where I will do a post of some of our simple new homeschool year traditions that include new school year photos, a cross cake, T-riffic summer t-shirt printables and All About Me Sheets! Hope your school year is blessed! Please contact me if you are interested! You can send me a DM though our etsy store. This year we are sitting out co-ops. I need a break from them. But CCM is fantastic. I have many friends who do it. Thank you Nicole! Have a blessed year! So far my son and I are liking the PACES guide! I hope to be in touch with you soon! Thank you! I am excited and a little anxious how co-op will work this year as it is our first one we are involved in. I am so grateful for a friend who is working so hard to start the co-op and get it off the ground. Have a blessed year with your son!